Web Applications are commercial strategies that get executed on the web through the use by the users, commercial business houses and data services. 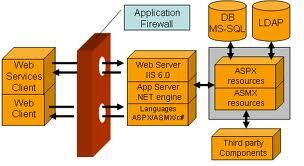 Web applications development is where the future of the companies lies. There are many endeavours that require applications for the web; one instance can be the interaction between one business and another. With the growing economy and the web projects going global, there are no geographical limitations at all; many companies are outsourcing their projects to companies elsewhere. In this kind of scenario web application development company come into play very strongly. Simply from applications similar to Paypal, to providing information regarding company's pricing information etc are all to be shared through secure web application programs. If at all there is assurance that the servers through which this kind of highly secretive company information can sieve through then only people would be willing to entrust such sites. This is where the website development comes into play for the IT industry. The web development services also become important because of the prevalence of web browsers everywhere and also the convenience that these applications have to offer. These web development applications offer to update without disturbing the balance even after installation on innumerable client computers. Also these are popular because of the constant support from inter platform compatibility. The common web applications can include online retailing and sales applications, webmails, online auctioning, fund transferability etc....just to name a few.